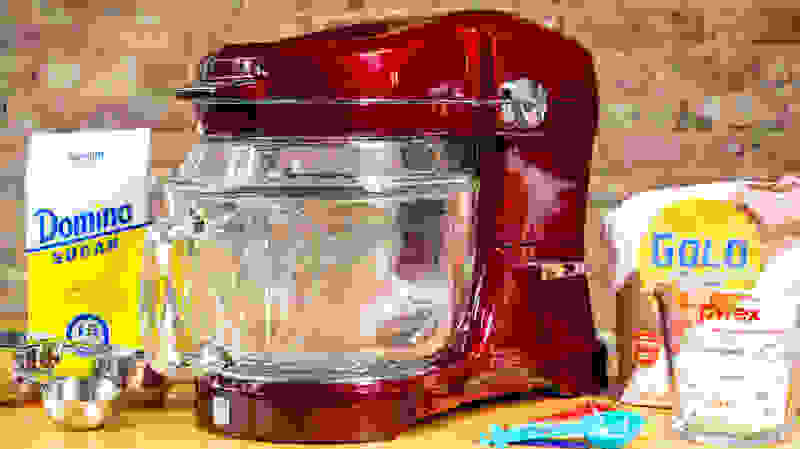 For time immemorial, KitchenAid has produced the very best stand mixers on the market. 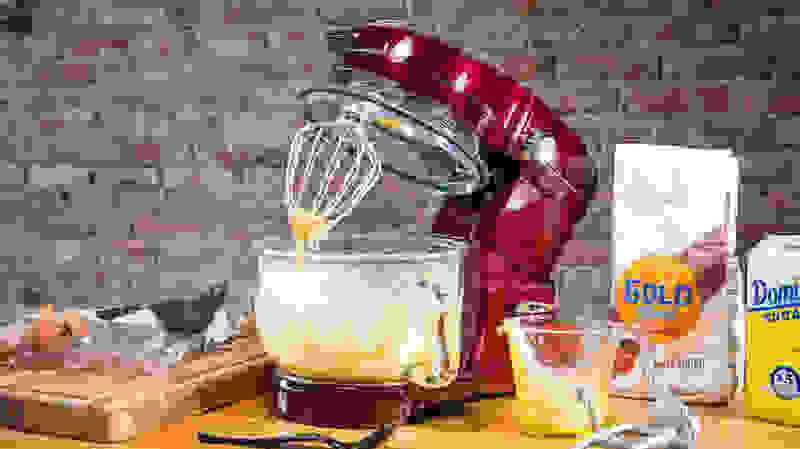 Although the brand sells a wide variety of home appliances, if someone says, “I just bought a KitchenAid,” you can be certain they’re referring to one of their sleek, high-performing, and covetable mixers. 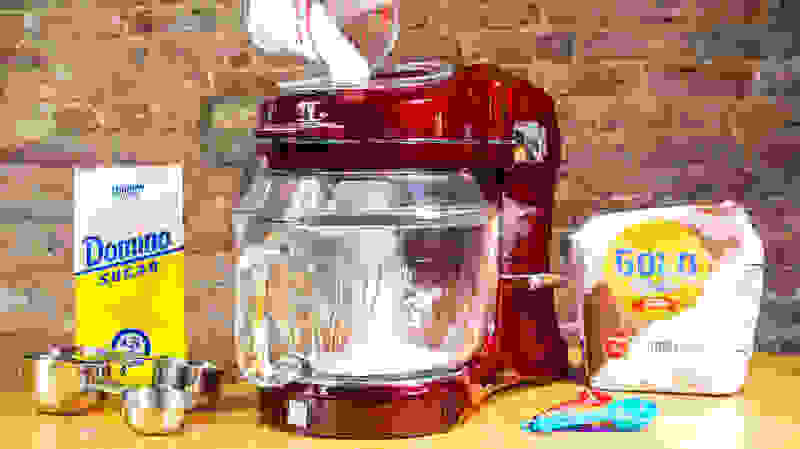 Reviewed currently ranks the KitchenAid Artisan 5-Quart at the head of the pack, with the Professional 600 series following close behind. 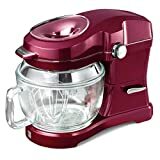 While plenty of companies have tried to take KitchenAid head-on with their own model mixers, no one has come close to shaking up the market and beating them at their own game—that is, until Kenmore introduced the Ovation, which is available for pre-order through Sears and Amazon until its release later this month (Sears will release it 5 days earlier, but that urgency will cost you an extra $50). A solid glass bowl makes the Ovation visually stunning—and very heavy. As the name suggests, the Kenmore Ovation is bound to elicit a round of applause—or at least a few oohs and aahs—whenever someone new walks into your kitchen. The innovative, patented pour-in top design allows users to add ingredients directly into the bowl without turning off the mixer or awkwardly tilting them in on the side. It’s beautiful, convenient, and unlike anything else on the market—but does it outpace the KitchenAid when it comes to actual performance? We ran the 5-quart Ovation and KitchenAid Artisan side-by-side through our own mixer obstacle course to find out. Kenmore has marketed the Ovation as the convenient, no-mess solution to conventional baking—and it lives up to that label. 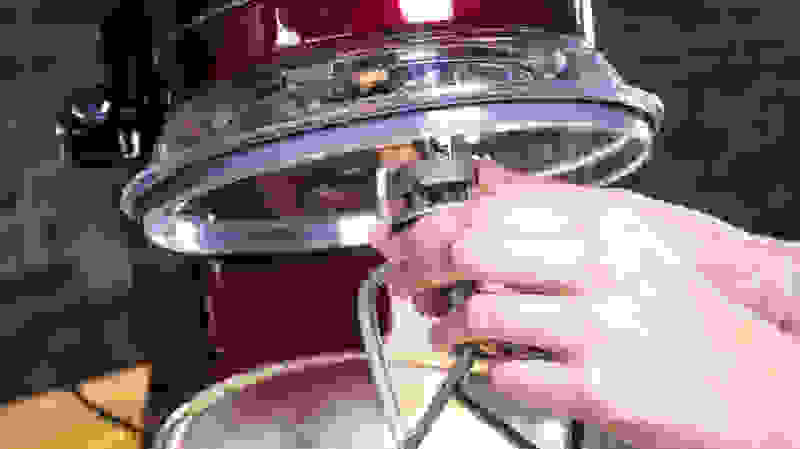 The mixer’s wide glass bowl and 360-degree splash guard fit snugly together to prevent event the smallest trace of flour from escaping its clutches, all the way through the preparation, mixing and clean-up stages. Unlike the KitchenAid’s optional, finicky plastic splash guard, the Ovation’s guard is designed to be left on at all times, only needing to be removed when it’s time for the dishwasher. Full disclosure: for normal baking needs, the KitchenAid's guard usually isn't necessary, but if you want to go all-out and dump a bunch of powdered sugar in all at once, the Ovation will protect you in a way that no other mixer can. For a regular baker like myself, it was hard adjusting to a completely enclosed bowl that you couldn’t prod at throughout the mixing process, but the pour-top and its plastic funnel cover made it easy to add extra ingredients as I went along. For this design alone, the Ovation seems like the right option when baking with children (who tend to make a mess and prod at mixtures even while they’re running) or for adults with any physical limitations that make using traditional mixers a challenge. The Ovation's pour-top design keeps ingredients inside the mixing bowl and off your countertop. Beyond its defining design element, the Ovation stood out in many of our kitchen tests. 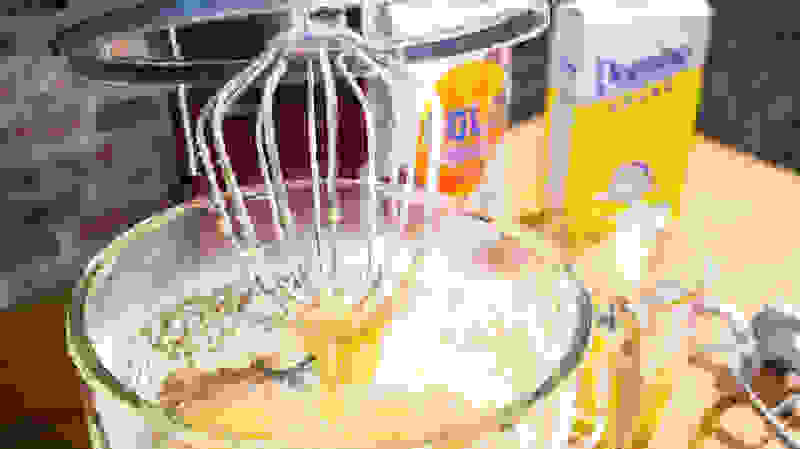 Like the KitchenAid Artisan, the Ovation comes with three standard attachments—a wire whisk, a flat beater, and a dough hook—that we used to whip egg whites, mix cake batter, cream butter and sugar, mix cookie dough, and knead bread dough. It evenly mixed chunky cookie dough and kneaded bread without struggling or walking across the counter, thanks in part due to its stout stature and heavy weight, and in the same amount of time as the competition. Because it’s shorter than many mixers, it may also fit better under some cabinetry and fare well in vertically-challenged kitchens. You can swap mixer attachments with the splash guard in place, though you might get your hands dirty. Although it doesn’t have the classic look of the Artisan, the Ovation is visually appealing in its own right—the solid glass bowl set against a deep marble base and silver accents come together with glittering, modern sophistication. The Ovation’s speed dial and release lever are sleekly designed and feel solid, not cheap, and its attachments are easy to swap out—they’re even interchangeable with KitchenAid attachments that many bakers already own, but don’t tell anyone I told you so. The lever releases the tilting head slowly, not with the heavy “thunk” of the KitchenAid. An automatic LED light is another fun bonus that (literally) highlights the mixer’s transparency, although it doesn’t seem essential when in use. The Ovation fits KitchenAid attachments you might already own. Though the Ovation's glass bowl is particularly beautiful, it’s also 6 pounds, very heavy compared to the Artisan’s metal bowl weighing just over one and a half pounds. While the casual baker might not be bothered by the weight, my arms were sore from carrying it by its handle between multiple batches and hand-washing sessions. This puts a distinct limitation on accessibility and ease-of-use promised by the pour-top design. The bowl isn’t the only thing goliath about the Ovation—the entire machine comes in at 30 pounds and is wider than most other mixers, meaning it takes up valuable counter space. Its size seems to work against it in other ways—it’s altogether slower and less nimble than the Artisan. It took nearly 4 minutes for the Ovation to whip up 3 egg whites—almost twice the time it took the KitchenAid at the same setting. The Ovation's paddle attachment also couldn’t quite get to the mixture at the very center of its wide, flat bowl. There was flour left unscraped and unmixed at its base after making chunky cookie dough, although this wasn’t an issue for thinner mixtures like cake batter. 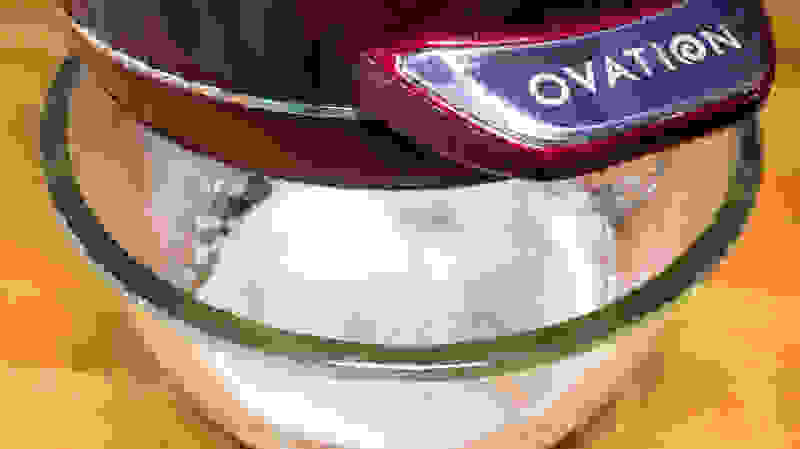 According to our measurements, the Ovation is also louder than the Artisan, with a slightly unpleasant whine that occurs during heavy-duty tasks like kneading dough. At 6 pounds, the glass bowl is very heavy and difficult to manage when not in use. While the 360-degree splash guard works overtime to prevent mixture from escaping the bowl, it might actually work too hard, as it got suctioned to the bowl and stuck twice during testing, making it challenging to open with the release lever. The Ovation comes with some fun little plastic accessories, specifically an egg separator and a chocolate grater, but both encourage bad habits (you shouldn’t crack eggs directly into your main mixture) and neither adds value to the main product. The Ovation took twice as long as the Artisan to whip 3 egg whites. The short answer? It depends. On one hand, this first model doesn't quite meet the gold standard set by KitchenAid. When compared directly to the Artisan, which is widely available for under $300 and still ranks higher after our testing, the Ovation falls short. 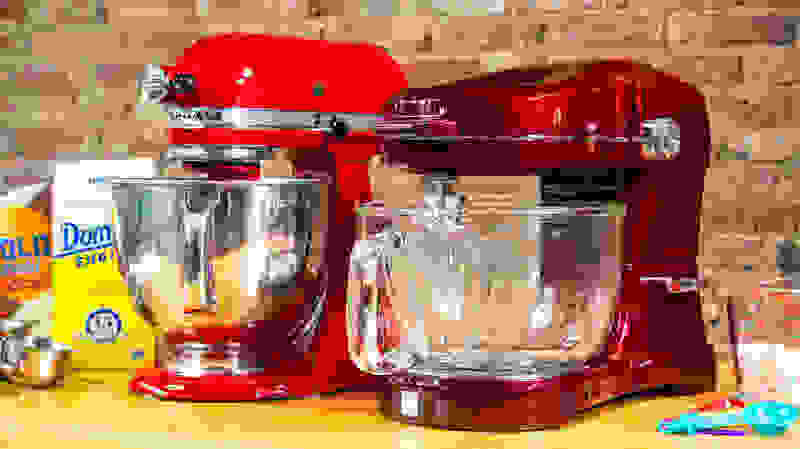 The KitchenAid Artisan and the Kenmore Ovation are both beautiful, powerful stand mixers, but KitchenAid's model still ranks higher in performance and value. On the other hand, the Ovation's pour-top design is likely the future of stand mixers, and if you're someone eager to be ahead of all home and living trends, buying an Ovation is a step in that direction. It's a serious, 10-speed mixer with a 500-watt motor, and that's nothing to laugh at. 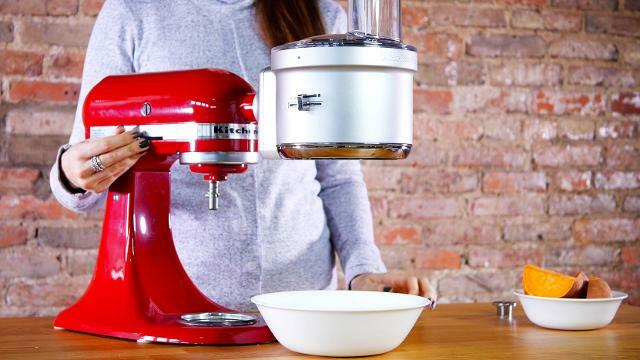 Kenmore even offers a 5-year limited warranty on their mixers, which is striking compared to KitchenAid's 1-year replacement policy with the Artisan. It's also worth noting that, while the Ovation is overall slower than the Artisan at whipping and mixing, total preparation time is comparable when you consider the time saved by the pour-top funnel. At the moment, the Ovation looks more like a shiny new talking point at dinner parties and less like the savior of baking, but here's hoping its innovation gives rise to a whole new generation of stand mixers.